Puerto Rico Governor Anibal Acevedo Vila has called on the UN to back his people's right to self-determination. Speaking to a UN committee, Mr Acevedo Vila accused the Bush administration of denying the US territory its democratic right to choose its own course. Puerto Rico has been a US territory since the late 19th Century, but gained greater autonomy in 1952. The UN panel voted to support a motion calling on the US to grant Puerto Rico the right to determine its own status. 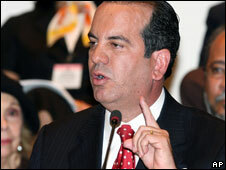 Mr Acevedo Vila's appeal to the UN reflected a change in tone for the governor's party, analysts said. The governing Popular Democratic Party has previously supported the Caribbean island's commonwealth status. The opposition New Progressive Party favours full integration into the US as the 51st state. The Puerto Rico Independence Party wants to achieve full independence. In March, Mr Acevedo Vila pleaded not guilty to corruption charges brought by the FBI linked to allegations of raising and then hiding thousands of dollars in illegal election campaign contributions. Mr Acevedo Vila told the UN Special Political and Decolonisation Committee that the US had failed to live up to the promises it made in the 1950s when it gave the island greater self-governing powers in return for remaining a commonwealth. He said he was there to defend the territory's "right to grow" under the terms of the 1953 agreement and to build on the sovereignty it was promised. The people of Puerto Rico would then be able to choose whether they wanted to become a US state or achieve independence, he said. He accused the US government under President George W Bush of being "clumsy and partisan" in its treatment of the issue. The resolution approved by the committee was put forward by Cuba and Venezuela. It also called for the US to release all Puerto Rican prisoners serving sentences for cases relating to the territory's independence movement. Mr Acevedo Vila has previously strongly opposed moves by the US Congress in Washington that he maintains would force Puerto Rico to lose its autonomy and become a US state. Residents of Puerto Rico cannot vote in US presidential elections. However, they can vote in presidential preference primaries and do elect a non-voting delegate to the US Congress.